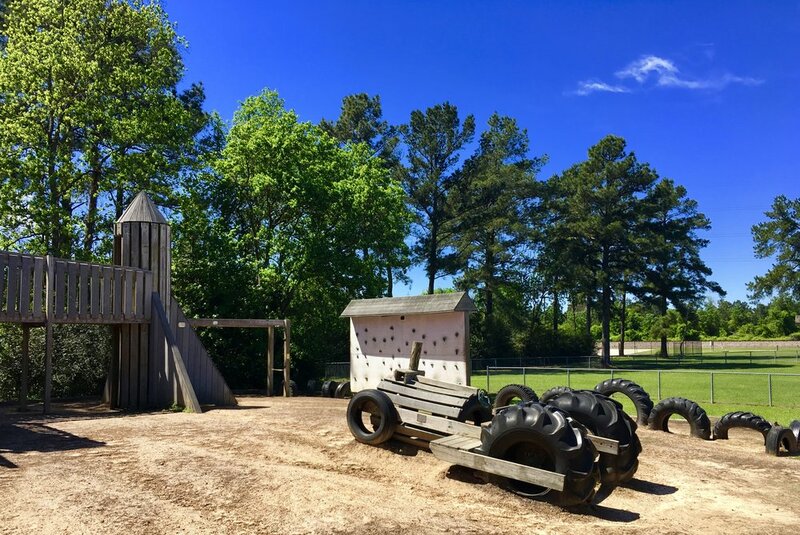 Commonly referred to as "Tire Park," Jerry Matheson park is a small, 10-acre park located in Tomball, Texas but don't be fooled by its small size. This little spot boasts an AMAZING playground, picnic pavilion, baseball field, lighted tennis courts and swimming pool. One of two firefighter poles! We fell in love with this park immediately. The zip lines, TWO fireman poles, and ladder hidden in a rocket ship were enough for the boys to want to stay at this park all day. From the looks of it (won't open for the season until May), the swimming pool is well maintained and spacious. The baseball field looks like the perfect place to take the kiddos on a Sunday afternoon for a game of catch. The park was in definite need of a fresh layer of mulch. It had rained the day before so there were some spots near the rope swings/zip lines that were a little muddy. It didn't put a damper our trip at all, but one of the boys did have a fall that resulted in a pretty dirty backside!